This venue is situated in the great red-brick building that used to be the Shell Laboratories. It is situated on the north shores of the IJ in Amsterdam and opened in 2013. Logically, a multidisciplinary mix of creative start-ups and professionals have been based in this this building since then, as it offers a great number of (new) media (and) art facilities such as a fablab, edit- video- and sound studios. A Lab hosts the Festival exhibition, workshops and the Creative Coding meetup. Entrance to the the exhibition is free, and don’t forget to check out the info for the workshops held at A Lab in Education section of this website. When the center for dentistry ACTA moved out of this building, an eight story space became available for creative start-ups and studios. Today, in ACTA we find not only studios, but also Radion. 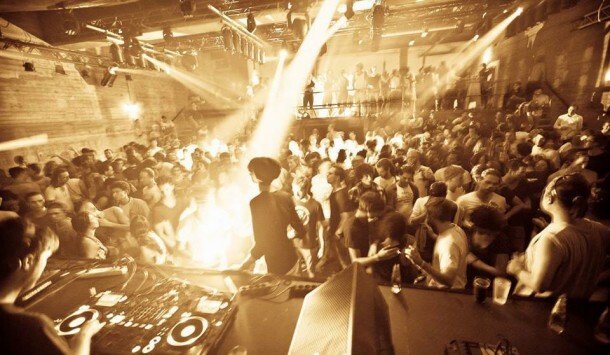 Cultural platform Radion houses a restaurant, a spacious exhibition room, a film room and a club. The industrial, Berlinesque vibe in this building fits FIBER Festival like a glove. The corners of the Subterranean could not be better explored in this dark area, during the AV & music performances, film screenings and club night. Some advice: travelling by public transport from A Lab to Radion can take up to 45 minutes and the night programme starts at 21.00h, so if you like nice & easy, grab the daily bite at the Radion restaurant before the show starts! Formerly the editorial offices of the old Volkskrant Newspaper, the stunning Volkshotel has repurposed and reimagined this unique industrial space. The result is a brand new cultural mecca in Amsterdam’s thriving center-east neighbourhood, where a growing series of special events, conferences, and parties now call home. Volkshotel will house the Festival Symposium. More details on the programme can be found on the Symposium section of this website. The nearest airport is Schiphol Airport. The fastest (and cheapest) way to get from here to the city center is by train. Links to travelplanners for public transport to and in Amsterdam can be found below. Please take note that you’ll need an OV-chip card in the Netherlands to use public transport. These cards can be bought at stations and in the trams or busses. Bicycle: Amsterdam is a bicycle city. If you’re spending several days in Amsterdam it is advisable to rent a bicycle, especially since you can use it anywhere and anytime – in contrast with public transport schedules ending around 03.00 / 03.30 in the morning in the weekends. Around Amsterdam Central station there are several bicycle rentals, but there are several more scattered throughout the city center. Public transport: Bus, tram or metro. Find the easiest and fastest door-to-door travel options via http://9292.nl/en. (Download the app). To A Lab: important to know is, that A Lab is in the North part of Amsterdam. To reach this part of the city you have to cross the river ‘t IJ. The ferries are at the North side of Amsterdam Central station, they leave every 5 or 10 minutes and are free. For A Lab, take the ferry to Buiksloterweg. View the walking route from the ferry to A Lab here. 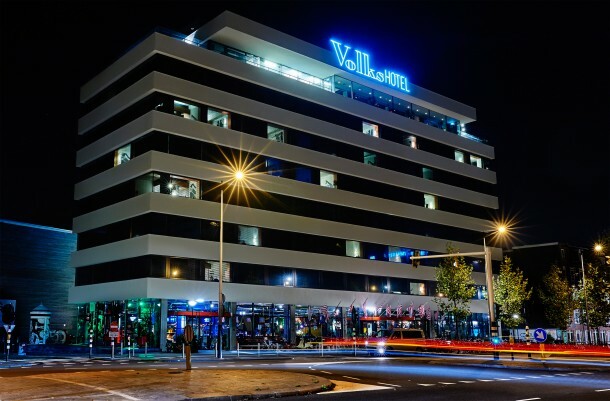 From Amsterdam Central station to Volkshotel: take Metro 51, 53, 54or Night bus 355 to stop Wibautstraat. From A Lab to Radion: take the ferry back to Amsterdam Central Station. From here, take bus 18 or tram 2 to stop Louwesweg. 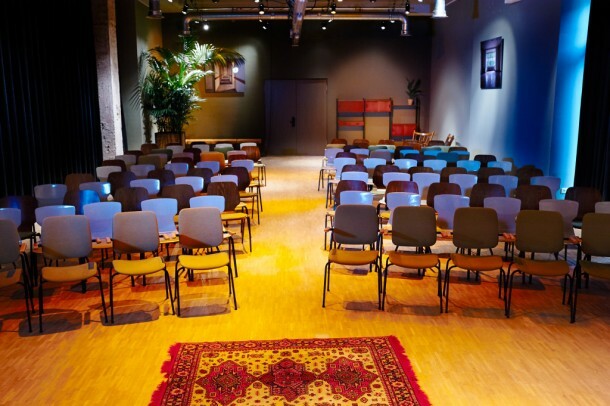 You can plan your trip via http://9292.nl/en to address Louwesweg 1, Amsterdam. Volkshotel is a place for festival visitors, FIBER guests, artists and night owls. A place where there’s life 24/7 and creativity flows. In Volkshotel, locals and travellers gather to eat, drink, work, sleep and play. With Werkplaats (café & co-working spaces), Doka (nightly basement cocktail bar), Canvas (club & restaurant on the 7th floor), Broedplaats VKG (85 work spaces for creative minds) and 172 hotel rooms, this former newspaper building is more than just a place for tourists to sleep. The reasonable prices and easy-going vibe make Volkshotel a place for everyone. Looking for a cheap space to share? Stayokay Amsterdam Vondelpark is one of the largest and most up-to-date hostels in Europe. It has a unique location in the middle of the famous Vondelpark – a stone’s throw from the city’s shopping streets, museums and vibrant nightlife. Every year, over 75,000 guests from all over the world stay here. From this hostel it’s only 15 minutes by bike to our night venue Radion.